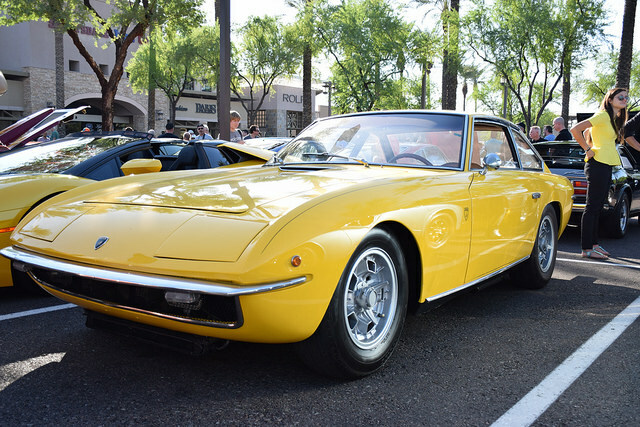 The Lamborghini Islero debuted in 1968, and was produced until 1969. The Islero had a 325 horsepower 4.0 L (3929 cc) V12 engine, a five-speed transmission, fully independent suspension, and disc brakes. Its top speed was rated at 154 mph and acceleration from zero to 60 mph took 6.4 seconds. Only 125 Isleros were built while it was in production. An updated version, the Islero S was released in 1969 with a stronger 350 horsepower engine. A number of styling changes including an enlarged hood scoop (which supplied air to the interior of the car, not the engine), slightly flared fenders, tinted windows, round side-marker lights, and a fixed section in the door windows. The Islero was named after a Miura bull that killed the celebrated bullfighter Manolete on August 28th, 1947. After thrusting his sword Espada deep up to its hilt into Islero, the bull in turn thrusted its right horn into Manolete, severing his femoral artery.